The Outlaws tackled Thunderbowl Raceway again last tonight. 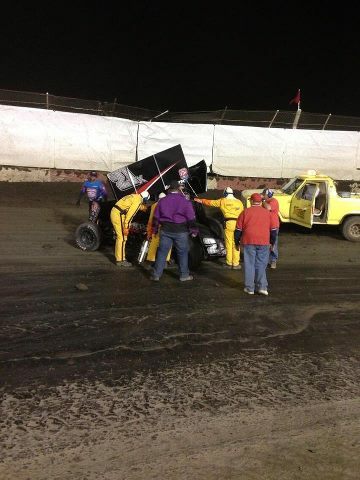 A new night brought a new foe to be battled - this time the hole got back up and the track took rubber. It made for a long night but this time with fewer crashes. Qualifying, for the most part, was uneventful with Quick Time honors going to Cody Darrah who turned a lap of 13.162 seconds. Paul McMahan, Sammy Swindell, Daryn Pittman and Brian Brown would make up the top 5 in fast times. The first heat race was a tip toe through Turn 1 that saw Joey Saldana break through for the victory in his Motter Motorsports No. 71M. Accompanying Saldana to the dash would be Lucas Wolfe in the Buffalo Wild Wings No. 82. Points leader Daryn Pittman, Jason Meyers, Dominic Scelzi and Wayne Johnson would transfer to the A main. The second heat saw new comer Kyle Hirst take the checkers and his dance partner to the Dash would be Jonthan Allard who returned from racing in New Zealand just this past weekend. Advancing to the A Main were Paul McMahan, Kerry Madsen, David Gravel and series champion Donny Schatz who started deep in the field after a poor qualifying effort. The third, final heat of the night would be the best race of the three and it would be won by Jac Haudenschild who would take Craig Dollansky to the dash along with him. Transfering to the A Main were Rico Abreu, Steve Kinser (in a huge turn around from last night), Kraig Kinser and Sammy Swindell. The Dash inversion draw was a 6 starting Jonthan Allard on the pole. The race would be fast paced and tell tale of what was to come. Trapped in two grooves either above or below “the valley”, as it was called, passing was at a premium. Allard would hold off Craig Dollansky at the line to take the pole for the A Main. Joey Saldana was able to advance the most positions starting in eighth and finishing sixth. The most excitement of the evening came in the Last Chance Showdown. With two laps to go, D.J. Netto booted Jason Sides in the tail tank and spun him out in Turn 4. Sides attempted to spin the car all the way around and reenter the fray but got hung up on the birm and required a push truck. Once he was refired, Sides went around the track to the second position on the field and returned the favor to Netto. Sides was disqualified for retaliating under caution and was done for the night. Netto would finish the race but would not race to a transfer spot with top wing damage. The Showdown would be won by last nigh'ts winner Tim Kaeding. Also transferring to the A Main were Brian Brown, Cody Darrah, Carson Macedo, Willy Croft and Mike Faria. Note valley in the rubber. Photo Credit: Shawn Miller for the World of Outlaws. The A Main would start 25 cars as the No. 88N of Netto was given a promoter’s option provisional to start the race. Craig Dollansky would jump to the lead and never look back. The track had taken rubber badly and left a one groove track on the low side. The top side was rough and treacherous. "The Valley" was in the middle. Steve Kinser would end up on his roof for the second night in a row when he got tangled up in an incident with Brian Brown and Kerry Madsen. Madsen would also end up on his roof. Both drivers would go to the work area and return to the race after repairs. Donny Schatz who had been spun on the restart and relegated to the rear of the field barely escaped the melee. The race was all Dollansky when officials determined that due to poor track conditions the rest of the restarts from Lap 8 to the finish would be single file. Some passing was possible if you were able to root the car in front of you up out of the rubbered in groove or if you timed your pass on the top to be back at the bottom before entering the Turn 1 end of the track. Dollansky timed his race in the last five laps to avoid slower traffic which would have certainly derailed the Outlaws train of single file follow the leader racing to take his first win of the season. Jonthan Allard would finish second and Daryn Pittman third. The hard charger of the race would be Tim Kaeding who climbed from 16th to sixth. The series champion, Donny Schatz, showed a gallant effort coming from 25th to 13th at the end of the race. I would like to take a moment here to offer our most sincere thoughts and prayers for the individuals who lost their lives at Marysville Speedway in California tonight. In a tragic a non wing accident, the sprint car suffered a mechanical failure and went full speed off the entrance to pit road, killing two in the pits. The event was canceled. I would also like to take a moment to ask you to remember the driver of that car in your thoughts and prayers and to remember that he will carry that moment in his heart forever. He will see it when he closes his eyes and he will always say what if I had… Truth is, it happened the way it was intended. With that I offer this simple thought, thank you for bringing all of our boys home safely to race again next week in the mighty wings of the Outlaws. 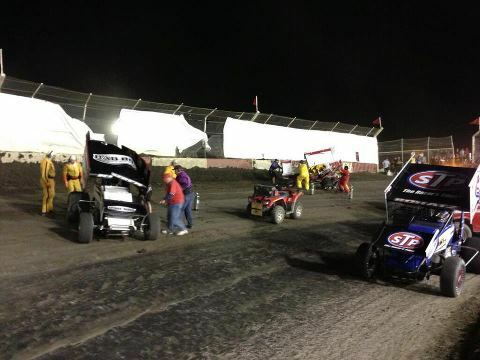 Qualifying Results: ‎ 1) Cody Darrah 2) Paul McMahan 3) Sammy Swindell 4) Daryn Pittman 5) Brian Brown. 6) Craig Dollansky. 7) Lucas Wolfe. 8) Jonthan Allard, 9) Kraig Kinser, 10) Joey Saldana, 11) Kyle Hirst 12) Jac Haudenschild 13) Jason Meyers 14) David Gravel 15) Rico Abreu 16) Tim Kaeding 17) Kerry Madsen 18) Steve Kinser 19) Warren Johnson 20) Donny Schatz 21) Jason Sides 22) Craig Stidham 23) Carson Macedo 24) Sam Hafertepe 25) Dominic Scelzi 26) Greg Wilson 27) Willy Croft 28) D.J. Netto 29) Mike Faria 30) Austen Wheatley 31) Chris Martin. First Heat Results: 1) Joey Saldana, 2) Lucas Wolfe. 3) Daryn Pittman, 4) Jason Meyers, 5) Dominic Scelzi. 6) Wayne Johnson. 7) D.J. Netto 8) Cody Darrah 9) Craig Stidham 10) Tim Kaeding 11) Chris Martin. Second Heat Results: 1) Kyle Hirst 2) Jonthan Allard 3) Paul McMahan 4) Kerry Madsen 5) David Gravel 6) Donny Schatz 7) Carson Macedo 8) Brian Brown 9) Greg Wilson 10) Mike Faria. Third Heat Results: 1) Jac Haudenschild 2) Craig Dollansky 3) Rico Abreu 4) Steve Kinser 5) Kraig Kinser 6) Sammy Swindell 7) Jason Sides 8) Sam Hafertepe 9) Willy Croft. 10) Austen Wheatley. Dash Results: 1) Jonthan Allard 2) Craig Dollansky, 3) Daryn Pittman, 4) Lucas Wolfe, 5) Paul McMahan 6) Joey Saldana, 7) Sammy Swindell 8) Kraig Kinser 9) Kyle Hirst 10) Jac Haudenschild. Last Chance Showdown Results: 1) Tim Kaeding 2) Brian Brown 3) Cody Darrah 4) Carson Macedo, 5) Willy Croft 6) Mike Faria 7) Sam Hafertepe, 8) D.J. Netto 9) Chris Martin. 10) Greg Wilson 11) Jason Sides (DQ'd) 12) Craig Stidham, 13) Austen Wheatley. A Main Results: 1) Craig Dollansky, 2) Jonthan Allard 3) Daryn Pittman 4) Lucas Wolfe, 5) Paul McMahan 6) Tim Kaeding 7) Sammy Swindell, 8) Joey Saldana 9) Kraig Kinser 10) Jason Meyers, 11) Warren Johnson, 12) Brian Brown, 13) Donny Schatz, 14) Cody Darrah, 15) Rico Abreu, 16) David Gravel, 17) Willy Croft, 18) Steve Kinser 19) Dominic Scelzi 20) Kyle Hirst 21) Jac Haudenschild 22) Kerry Madsen 23) D.J. Netto 24) Carson Macedo. 25) Mike Faria.